Station XIII, “Jesus is Taken Down From the Cross,” by Caroline Abreu. A traditional part of the Holy Week experience for many Christians is observing the Stations of the Cross, also known as the Way of the Cross. There will be Stations of the Cross during Holy Week at Trinity Baptist Church, where members of the church design stations. 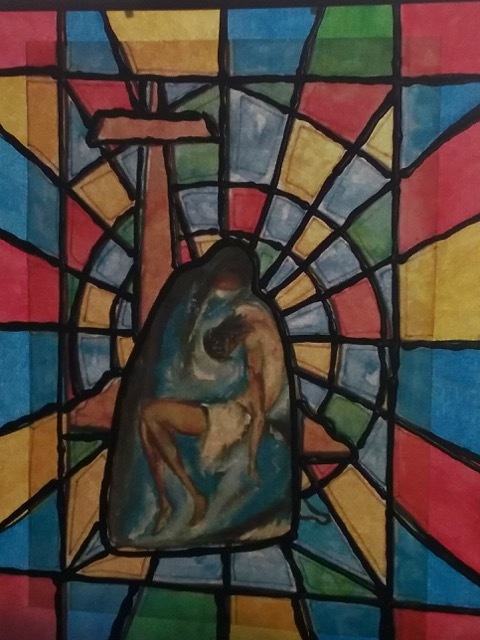 Fourteen pieces will be in the windows of the church from Palm Sunday through Easter, with a walk of the stations Tuesday. Traditionally, artists have given physical form to the story of the Passion. The role of art can be to instruct, educate and interpret. Going beyond mere description, it can express a spiritual journey. Several members of the Trinity Episcopal Church congregation are participating in this creative endeavor to share their impressions of the stations. They will be in the windows of the church and available for viewing during Holy Week, with a journey through the “Way” Tuesday, April 16 at 6 p.m.
All are welcome to attend and participate in the Stations of the Cross and to view the installation in the church; there is no charge for admission. Interested groups can contact the office at (318) 352-3113 for further information. The historic Trinity Episcopal Church is located at 533 Second Street in Natchitoches.